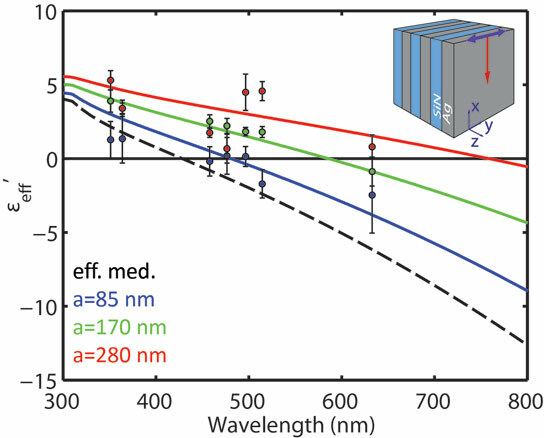 Effective permittivity of a layered Ag/SiN-metamaterial for a variety of layer thicknesses. By stacking nanoscale layers of silver and silicon nitride, scientists have fabricated a metamaterial that gives visible light a nearly infinite wavelength. Researchers from the FOM Institute AMOLF and the University of Pennsylvania have fabricated a material which gives visible light a nearly infinite wavelength. The new metamaterial is made by stacking silver and silicon nitride nanolayers. It may find applications in novel optical components or circuits and the design of more efficient LEDs. The work was published on October 13 in Nature Photonics. The phase velocity and group velocity of light dictate how light propagates in a material. The phase velocity determines how the peaks and valleys of the wave move in the material, whereas the group velocity describes the transport of energy. According to Einstein’s laws, the transport of energy of light can never be faster than the speed of light. Therefore the group velocity is limited. There are however no physical limitations to the phase velocity. When the phase velocity becomes zero, there is no movement of the peaks and valleys of the wave; when it is infinite the wavelength diverges to very large values. In nature however, no materials with such special properties exist. The research team now presents a metamaterial composed of a unit cell structure much smaller than the wavelength of light. By stacking nanoscale layers of silver and silicon nitride a new material is fabricated in which light ‘feels’ the optical properties of both layers. The way light travels through matter is dependent on the material permittivity: the resistance of a material against the electric fields of light waves. Because the permittivity of silver is negative and that of silicon nitride is positive, the combined material has a permittivity which is effectively equal to zero. Therefore, it seems that the light experiences zero resistance, and propagates with an infinite phase velocity. The wavelength of the light is nearly infinite. 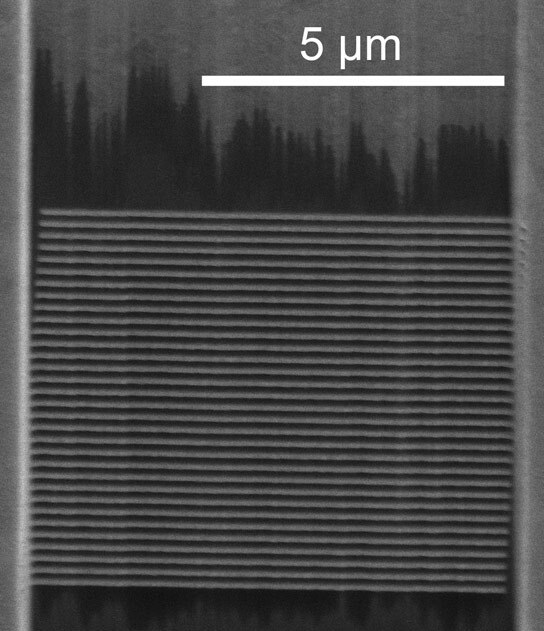 The researchers fabricated this material using focused ion beam milling, a technique that allows control over the structure of a material on the nanoscale. With a specially built interferometer it was shown that light indeed propagates through the metamaterial with no significant change of phase, corresponding to an almost infinite wavelength. This new material may find applications in novel optical components or circuits and the design of more efficient LEDs. 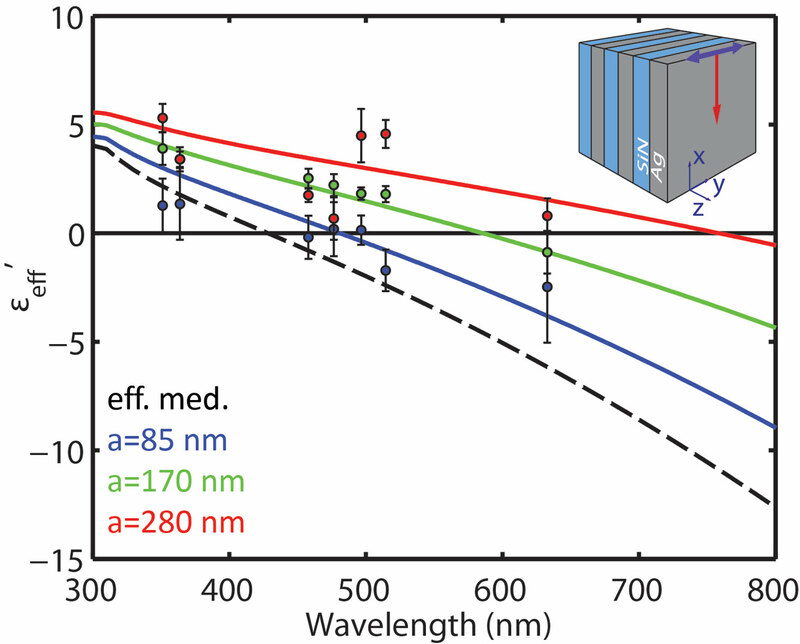 2 Comments on "New Metamaterial Gives Visible Light a Nearly Infinite Wavelength"
Wow. This is just nuts. *cringes* “nearly infinite” is not quantifiable and is actually quite relative in notion. Our ability to measure “infinite looking” stuff is essential for comparison. In the 80s the thought of a terabyte of data would seem quite infinite to most and by todays standards is very finite. It’d be better to hear stated precisely how much this “almost no phase advance” actually is. More important, how does it compare against our existing capacities? What magnitude of precision have we improved our ability to create and read waves with less phase advance?